There is a small town in Missouri named Seneca after a Native American tribe which is now known as the Seneca-Cayuga. The name means “Keepers of the Door,” and was already the common name for the area when the town was born in the 19th century. Seneca was known as “the little town on the border” when it was established on the edge of Indian Territory. Since Oklahoma became a state in the early 20th century, Seneca has been on the Oklahoma-Missouri border. Today, Seneca is a vibrant small American town with a growing population. 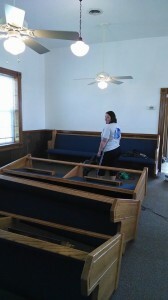 We visited recently to install new church pews in Swars Prairie Church of Christ in Seneca. 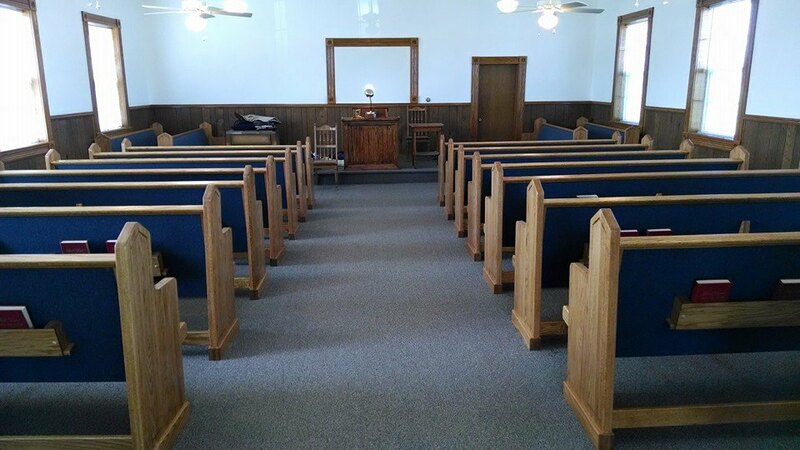 Swars Prairie Church is a small, modest church with few decorative elements so we made sure that the new church pews matched in style without ostentatious elements that would look out of place in Swars Prairie Church. 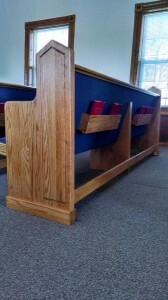 These church pew ends are a full length style that is mounted on the floor instead of a floating church pew end. The pew ends also have a small, modest decorative border on the side that subtly highlights their shape. The fabric the congregation at Swars Prairie Church chose is a beautiful blue color that pairs well with their carpeting. It also sets off the bright red of the hymnals their church uses in the book racks on the back of each pew. You’ll also notice they opted for a top rail along the church pews for an additional subtle decorative element. On this trip, Rex’s wife came to help install the church pews. Usually Courtney Blisard stays at the church furniture workshop to keep things running while Rex and his crew are out delivering and installing church pews. Since we’re a family run business, it often means we wear many hats when we need to, just like your small church. If you need help finding the right church furniture for your church, give us a call and we can help. 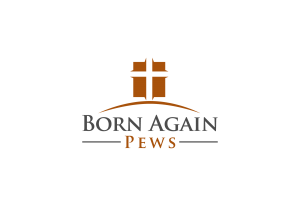 We offer free quotes too to make it easier to figure out what kind of church furniture you can afford—and you might be pleasantly surprised to find it’s more than you thought with Born Again Pews.